The Maritime Hockey League (MHL) has announced its three stars for the week of November 11th – 17th. This week’s third star is Miramichi Timberwolves forward Rankyn Campbell. The 20 year old from Galloway, New Brunswick makes his second appearance in the league three star selections on the strength of four goals in two games. On Thursday night in New Glasgow, Campbell scored the lone goal for the Timberwolves in regulation as the visitors defeated the Pictou County Weeks Crushers 2-1 in a shootout. With the win, the Timberwolves pulled off the impressive feat of being the only team in the MHL to defeat the league leading Crushers at home twice this season. 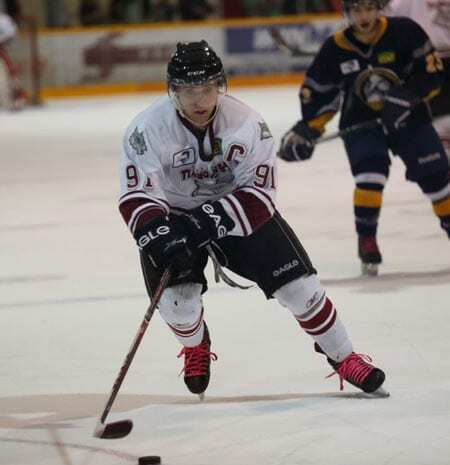 Not to be outdone, the fourth year MHL veteran fired a hat trick on Saturday night in leading the T-Wolves to a 7-1 victory over the Campbellton Tigers at home. For his efforts, Campbell was named the game’s first star as Miramichi won for the 11th time this season. Campbell now ranks fifth in the MHL scoring race with 24 points as well as being tied for second in the league goal scoring derby with 13. This week’s first star went to Amherst Ramblers forward Daniel Walsh while second star honours went to Dieppe Commandos goaltender, Connor Wilkinson. The Miramichi Timberwolves next home game is this Saturday, November 23rd, when they host the Amherst Ramblers at the Civic Centre. Game time is 7:30 pm. Janice A Young-Hogan liked this on Facebook.